I’ve been making lots of delicious caramel lately, whilst testing recipes for my forthcoming book. Caramel is made by heating sugar until it melts and takes on a deep amber colour. There are two ways of making it: wet and dry. Wet is heating sugar and water together and dry is heating just the sugar. I’ve been using the dry method. Making caramel can be a tricky business but I’ve learned that if you follow a few golden rules, if you’ll forgive the pun, you’ll have little trouble with it. 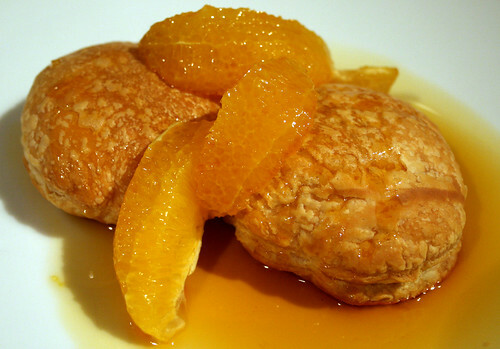 It’s a great thing to know how to make and it can transform desserts into quite spectacular dishes. Be careful and never touch or be tempted to taste hot caramel. Caramelisation occurs when sugar reaches around 170c – much higher than boiling water – and it can quickly get a great deal hotter, so never take your eyes off sugar or caramel that’s on the heat. Caramel sticks to everything, including skin, and is scalding hot so will burn you terribly. It will spit and splutter when liquid or butter is added to it so hold it at arms length, wearing an oven glove, if you need to do this and take care. You need a medium high heat to make caramel. You don’t want to heat the sugar too quickly; it needs to be controlled. I set off my fire alarm by heating it too quickly and the smoking was quite alarming. It can take around 10 minutes from start to finish so take your time. Nothing will appear to happen for quite some time but wait and watch; it will get there. Get the caramel to the right point. You need the flavour of the molasses in the sugar to come out to give the special taste of caramel and you need to be confident enough to allow it to reach a deep, golden amber colour for that to happen, so you don’t want to take it off the heat too soon – if you do the caramel will be too sweet. Equally, however, it can quickly overcook and take on a bitter taste. If you’re unsure the best thing to do is to take the pan off the heat, check the colour and put it back on if necessary. You could also have some water in the sink ready to plunge the pan into to cool it down if it starts to cook too much. Your nose, as well as your eyes, will tell you when it’s reached that wonderful caramel stage. Once you’ve poured the sugar into your pan shake it so that the sugar forms and even layer, and while it’s heating shake the pan every now and then so that the sugar dissolves evenly, otherwise you may end up with bits of it cooking quicker and burning before it’s all turned to caramel. Decide before you start if you want hard set versus liquid. 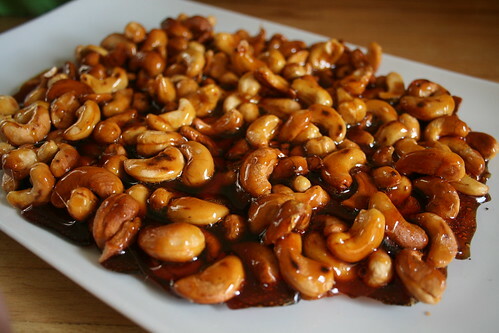 Once your sugar has turned to caramel you can use it as it is, pouring it over nuts as in the recipe on page (X) for example, and it will set hard. Alternatively you can add butter, water or cream to the hot caramel – carefully, see rule #1 – to give you a liquid caramel such as a creamy sauce. Either way make the decision before you start making the caramel; once it’s off the heat it will quickly start to cool and harden. One final thing: to clean a pan of caramel fill it with water and bring it to the boil, which will dissolve the caramel. I’m no expert on the making of caramel and there are more complex instructions out there and other factors to take into consideration, but these few rules should set you out on the right foot. 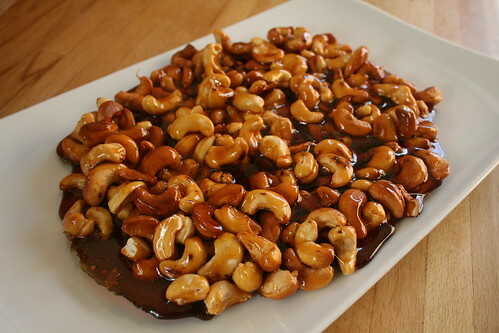 I'm pretty certain I would like to fall face first into that plate of carmely cashews. Thanks for the tips! Good advice, caramel is a favorite of mine but I am by no means an expert caramel maker! Those cashews look divine. Those cashews looks SO yummy! cool recipe..Back my home, my mom used to cook this that we all loved it all time…you reminded me this to cook now…thanks mate…to be honest, i broke into tears with happiness as am feeling a bit home sick.. This is a great tutorial on making caramel. Those caramels look divine! Julia – where was this info when I was trying to make that silly caramel to top my watermelon mint pie?! Did you get that idea from my screw up? 🙂 Great info. Your picture has me salivating Julia! Hello, you have the most beautiful blog here, I'm loving reading it and your pictures are just stunning… thank you so much !!!! S.Stockwell – mmm, lime thyme ice cream sounds fantastic. MissMVK – I wouldn't recommend it; they're rock solid! Making Recipes – oh I'm so sorry you're feeling so homesick, but pleased that I've brought you a little happiness with this post. Applecrumbles – lol, no it was purely coincidence, I promise! I'm a bit of a wimp when it comes to making caramel/fudge/toffee/anything involving heating up sugar. Your tips could well come in handy if I'm brave enough to try again in the future! Very informative post on caramel!